In the year 1834, Mr B. came to Paris for the purpose of undergoing operation for a cancerous tumour of the orbit; the growth had acquired the size of the head of a foetus. This is not a terribly useful comparison, given that a foetus may be anything between microscopic and baby-sized. I imagine this tumour was about the size of an orange. Pains in the limbs and some degree of previous paralysis, showing that the brain was, in all probability, implicated, induced Professor Sanson at first to set aside all idea of an operation. This sounds sensible clinical judgment. Professor (Louis Joseph) Sanson was a close friend of Guillaume Dupuytren, and succeeded him as professor of surgery at the Hôtel-Dieu, the oldest hospital in Paris. Sanson was concerned that the tumour had already invaded the brain and was therefore impossible to remove without causing neurological impairment or even death. But the patient having expressed his settled determination to destroy himself if the operation was not proceeded with without delay, M. Sanson consented to operate in the presence of several British practitioners, fellow-countrymen of the patient. A horribly risky undertaking, no doubt, but one can understand the dilemma the surgeon faced. A portion of the frontal, the nasal, and maxillary bones having been removed, the dura mater was found to be affected, and was likewise excised. The dura mater is a thick membrane surrounding the brain. It sounds as if the surgeon had had to excise a large quantity of bone at the front of the skull – hardly a pleasant experience for the patient, who was undergoing the operation without anaesthetic. At best, he may have received some opium to relieve the pain. But the cerebral substance itself was occupied by the disease, and after a short conference, in which Sanson alone persisted in the opinion that it was his duty to achieve the operation he had begun, one ounce and a half of cerebral substance was removed by a section which penetrated into the lateral ventricle. 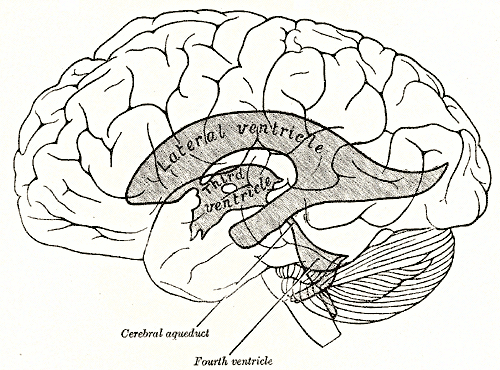 The lateral ventricles of the brain are cavities containing cerebrospinal fluid (CSF). They are deep inside the brain, which gives some indication of just how major a procedure this was. The cerebral vessels were cauterized with a heated probe, and the patient recovered completely from the effects of this tremendous operation—no paralysis, no disturbance whatever of the cerebral functions, having been observed. An amazing outcome. The brain consumes as much as 20% of the body’s oxygen supply, with its needs being met by a considerable network of blood vessels. It says much for Professor Sanson’s skill that he managed to avoid causing any major haemorrhage; but the truly surprising thing is that he also succeeded in excising the tumour without causing significant damage to the brain tissue. Sixteen months after, the patient died in consequence of reproduction of the growth in the scar, and on dissection the disease was found to extend as far as the posterior cerebral lobe. A sad but probably inevitable result. With a tumour that had spread so widely there was always the risk of recurrence. Nevertheless, the surgeon undoubtedly succeeded in prolonging the patient’s life – both of them deserve credit for their courage in going through with what was a desperately risky procedure.